Imagine that the junk plastic floating in the sea could be used to 3D print floating villages. 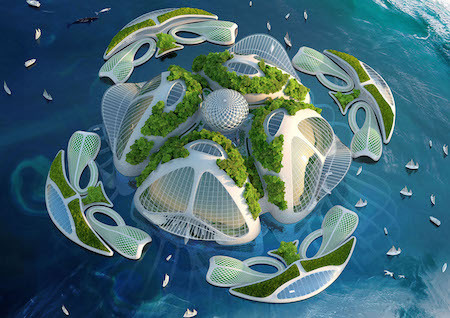 The structures, envisioned by architect Vincent Callebaut, would recycle ocean waste harvested from international waters as building materials for new, sustainable marine architecture. The composite material would comprise a mix of plastic waste and algae. Biomimetic and completely self-sufficient, these sustainable habitats are a vision of an egalitarian society for environmentally conscious individuals. The inhabitants of these utopian structures, called the People of the Seas, would invent new underwater urbanization processes to mitigate ocean acidification and pollution, while living in a self-sufficient way. They would recycle 100 percent of ocean plastic waste to create a sustainable habitat called Aequoreas. Once built, these ecosystems would continue to grow on their own, using calcium carbonate contained in water to form an external skeleton, semi-permeable membranes to desalinate seawater and microalgae to produce energy for heating and climate control.